Tim Tebow should be taking notes! spouse and children for a glimpse at the 2nd round of the playoffs. Thanks a lot Jeremy Lin! Many people are comparing Jeremy Lin to Tim Tebow, which in some ways is a fair comparison. In other ways, it’s the biggest insult you could give the young man. Lin, a second year player out of Harvard, has shocked Knicks fans into insanity after an unbelievable 6 game stretch that has drawn comparisons to some of the NBA’s greatest. 1) Lin is a very fundamentally sound NBA point guard. One of the best things about seeing Lin be successful this early is that his game is deeply rooted in team basketball. He doesn’t seem to have a complex about being ‘the guy’. He appears to be a very advantageous point guard. While his scoring totals have been high in his first few starts, he has looked to get his teammates involved at every turn, fully embracing Mike D’Antoni’s system. 2) Lin has a TON of room for improvement. While Knicks fans are ready to compare Jeremy Lin to Isaiah Thomas, he has turned the ball over 31 times over the past 6 games. By no means is that an awful rate considering that this is Lin’s first year as a starter. However, this should be a cause for concern for Knicks fans due to the fact that there will be stiffer competition for the Knicks as they approach the playoffs. They won’t be playing the Raptors, the Jazz or the Wizards. 3) Lin has the easy task of establishing himself as a leader on a team with two perennial all stars in Amar’e Stoudamire and Carmelo Anthony. While Anthony and Stoudamire have come out publicly and said the right things, the truth is that it will take time for them to adjust. During a season with little to no practice time. With very little rest between games. Rajon Rondo knowing exactly where to get the ball to Kevin Garnett in the post or where to get the ball to Ray Allen on the wing takes time and team chemistry to get to perfection. 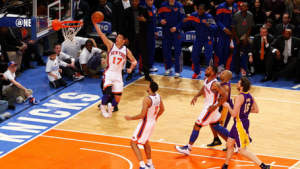 4) Last, but surely not least, Lin has the task of ignoring the rabid Knicks fans. While Lin’s star shines bright today, he will have bad games. Everyone does. The New York sports fan has never been known for its’ rationality. If you recall last season, a certain fan base was clamoring for a player in Denver and claimed that he was the missing piece. There was a video montage and a huge homecoming for this player. Fast forward 9 to 10 months later and that same city questions whether that star should be traded or if he is a part of the problem. To Mr. Lin: Please ignore the fans and media, and concentrate on getting better everyday (in my best Bill Belichick voice) because on the side of that schedule are match ups with some players who have a lot of pressure on them as well. Mr. Rose, Mr. James, and Mr. Wade are not concerned with you ‘making history’. They want rings like Liberace. Don’t go out like Tim Tebow. Creative. Sports addict. Music critic. Et Facta est Lux. Great article. I like this writers style.